Painter: Effect may be positive. 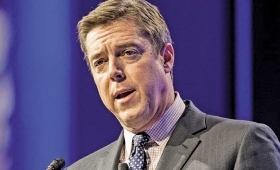 For TrueCar Inc. founder and CEO Scott Painter, the split with dealership giant AutoNation Inc. is not about money and car-sale deals. "We feel passionately," he told Automotive News, that in today's marketplace, consumers require "truth, transparency, an upfront price." And TrueCar, in Painter's view, needs data to provide that transparency. When AutoNation wouldn't supply that data, the relationship had to end. Painter said TrueCar gave AutoNation "a clear line in the sand" and demanded the retailer comply with its data-sharing terms, which he called "marketplace requirements we need to enforce." "This isn't AutoNation dropping TrueCar," Painter said. "This is a very deliberate step on our part. We went to them and said, 'You must comply with the rules of the marketplace.'" He added: "The notion that anyone gets a hall pass on those requirements is untenable." In fact, Painter said, TrueCar has "fired" more than 350 dealers in the past 12 months for refusing to comply with its terms. That is more than the 226 of AutoNation's 240 dealerships that use TrueCar's services. TrueCar works with dealers across the country holding more than 11,000 franchises. "The partnership with AutoNation just turned into, in a sense, a choice for the consumer," Painter said. "It really makes them our competition." Although TrueCar doesn't sell cars as AutoNation does, Painter said his company is in the "customer-acquisition business" -- a field in which AutoNation is expanding its own branding and operations. In a separate interview with Automotive News, AutoNation CEO Mike Jackson said his company was severing ties with TrueCar as of July 15. Jackson said TrueCar had been trying to impose "onerous" demands, including requiring that AutoNation provide extensive customer information for all of its transactions, not just TrueCar-related deals. "Ironically, this could have a positive financial effect for us," Painter said. "The customers that otherwise would have been introduced to AutoNation stores will immediately begin getting introduced to other TrueCar certified dealers." AutoNation represented 3.1 percent of TrueCar's total revenue in the first quarter of 2015, down from 3.2 percent a year earlier. Users of the TrueCar platform who purchased from an AutoNation dealer represented 4.2 percent of TrueCar's total units in the first quarter, down from 4.6 percent.